Khandallah was part of the Onslow Borough from 1890, until Onslow Borough Council amalgamated with Wellington City Council in 1919. The first library in Khandallah opened in 1947, when a local resident, Fanny Irvine-Smith, collected signatures for a petition seeking its establishment. This library was run from an old house on council land. The present library was opened in 1953. Our borrowers span all age groups and have a strong library commitment. Our catchment area includes the areas around Khandallah such as Rangoon Heights, Cashmere, Te Kainga and Ngauranga. On average we serve around 1600 customers per week. Khandallah Pre-school Storytime is held on Tuesday mornings at 10:30am in the children's area. All welcome. For more information about this programme please visit the Khandallah Library whats on page! Khandallah Library has a boutique library collection that has been developed to reflect the interest of the community. People come in and browse to find something new and different to take home. Khandallah Library's collection comprises about 15,000 items. We also hold the F.L. Irvine-Smith Memorial Collection which is a collection of New Zealand works donated to the library, in memorial to Fanny Irvine-Smith. 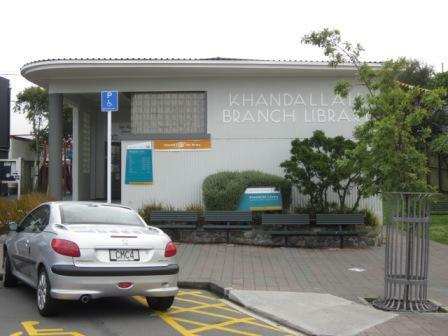 The Māori branch name for Khandallah Library is Tari-kākā. Tari-kākā peak appears to be the correct form of the name of the high summit behind Khandallah, usually called Kaukau but also referred to as Kākā Hill.- this indicates a place where kākā snares were set. Interested in other Māori branch names? Visit our Māori branch names page.